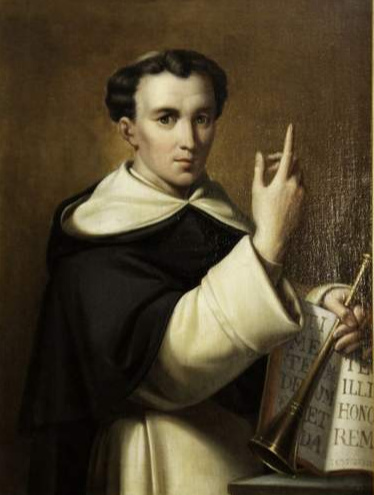 O Glorious apostle and thaumaturge, St. Vincent Ferrer, the new angel of the Apocalypse and our protector, accept our humble prayer and bring down upon us the abundance of divine favors. By that charity which animated thy heart, obtain for us from the Father of all mercy the pardon of our sins, steadfastness in the faith, perseverance in good works; so that living a fervent Christian life, we may deserve thy powerful patronage. Extend that patronage even to our bodies, and free them from infirmity. Preserve our fields from the damages of storm and hail, and keep off all misfortune. Thus favored by Thee with blessings in soul and body, we shall ever be thy devout clients, and one day with thee praise God in heaven, world without end. Amen. And then for the true Dominican geeks. This might be Latin only.